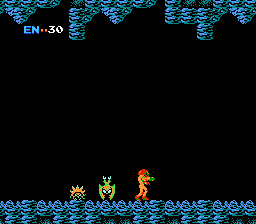 This is a hack of the original game Metroid. It still preserves the best of Metroid but gets a new twist that still feels much like the original. The game still uses the same rooms as in the original Metroid. but with a completely different map. The brother game to Metroid Adventure, Super Metroid 8-Bit uses the same map (basically) but different rooms themed after rooms in Super Metroid. Note: Although the author tried to refrain from editing the rooms AT ALL, it wasnâ€™t possible. Two of the rooms in Norfair were edited in minor ways, none visible (two bomb-able floors were made unbreakable).